Posted on October 17, 2018 October 18, 2018 Author kalingaCategories Techපුවත්, පැන විසඳුම්2 Comments on EP216: කැමරා 4රේ ෆොන් ? රනුකගේ අලුත් ෆොන්, Oneplus VoLTE, දුරකතන රෙඩියේෂන්, අනයන තහනම් බාන්ඩ ? සිංහලෙන් පරිගනක ? Dolby ATMOS හා surround sound system, iOS 12 හා අලුත් iPhones, බැංකු වල අයකිරීම් වලින් ගැලවෙන විදි, app දැම්මහම මුදල්, Apple smartwatch, හොද Audio quality system ගැන. රනුක twitter DM කියවයි. Alexa ද google assistant ද ? හොද food delivery service ? කාලිංග සීනි නොකයි ? 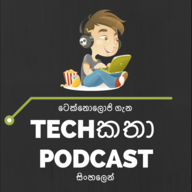 Posted on September 25, 2018 Author kalingaCategories Techකතා, Techපුවත්, පැන විසඳුම්1 Comment on EP215: Dolby ATMOS, Surround Sound, iOS, අලුත් iPhone, බැංකු වල අයකිරීම්, Smartwatch, Audio quality, ලංකාවේ data ලාබයි ? Posted on May 9, 2018 May 9, 2018 Author kalingaCategories Techකතා, Techපුවත්, පැන විසඳුම්6 Comments on EP199: Facebook F8, full stack developer, DJI Windows SDK, Amplifiers and Speakers.